The NOPD is requesting the public’s assistance in locating the gunman pictured above committing of an armed robbery in a Hollygrove store on March 15. At about 8 p.m., a man with a mask over his face was seen entering a business in 8800 block of South Claiborne Avenue, near Eagle Street, armed with a handgun. He then reportedly robbed the business and an employee before fleeing, driving south on Claiborne toward Jefferson Parish. Anyone with information on this incident or the pictured subject is asked to contact NOPD Second District detectives at 504-658-6020, or call anonymously to Crimestoppers at 504-822-1111. 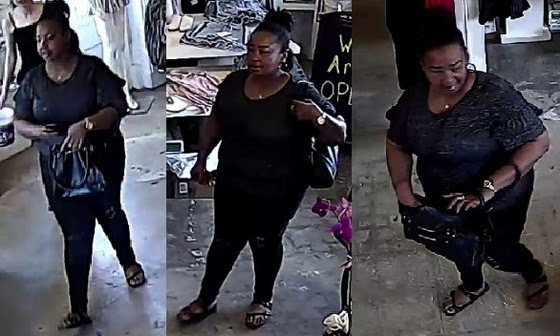 The NOPD is seeking assistance from the public in identifying and locating a subject who is wanted in connection with a theft that occurred at a store in the Riverbend area. On March 14 at around 3:45 p.m. in the 8100 block of Maple Street, the woman pictured above reportedly reached behind the counter and removed the victim’s wallet and keychain. Anyone with any information that can help Second District detectives identify and locate the pictured subject should call 504-658-6020. Citizens with information that can help solve crimes are also asked to call Crimestoppers at 504-822-1111.